The NCAA Tournament is back. It feels like months ago that we basked in the glory of days featuring 12 hours of college basketball, but it was really just a week, give or take. There's not quite as much action on Thursday night, but four high-quality games is nothing to sneeze at. And to anyone questioning whether or not this tournament has been good, I will happily refer you to my colleague Matt Norlander's point about what chalk could mean -- the ability of the high seeds to hold on throughout last weekend means that there were some boring tournament games in the Saturday/Sunday slate, but it also means that we're now going to get a run of games that are incredible matchups. We have a single seed outside of the 4-5 line. Only Oregon has invaded the Sweet 16 out of a group that boasts SEC Tournament champion Auburn, a team that looks capable of winning it all if we're being honest, as the lone "sleeper" team (a five seed!) left standing outside of the Ducks. In other words, beginning on Thursday night we're about to see some great basketball. Let's pick a few winners from the games on this evening. Tennessee has been a great team all year long. Rick Barnes has worked miracles in Knoxville, turning the Volunteers into a legitimate title threat and making Tennessee a basketball school. (Don't fight it, Vols fans. Just embrace it until Saban retires.) But look at what Tennessee's done this tournament, and couple it with Barnes' record in the tournament in his career, and it's not hard to get excited about the idea of taking Purdue as a very live dog. Sixty-six percent of the bets (again via the Action Network) are being placed on the Volunteers. And I'll be honest, if you'd shown me this line before the tournament, I would have hammered Tennessee. I didn't know much about Purdue. I thought they were the worst No. 3 seed in the bracket. That's not true. I watched them against Villanova and that was a dismantling -- they're a top-five offensive team by KenPom metrics and a top-30 defensive team. We all slept on them, and they've proven to absolutely be a dangerous Final Four contender. With Tennessee's issues closing out games against Colgate and Iowa -- the former a No. 15 seed, the latter a team that was down by 25 points -- I think we could see Purdue really surprise people here. SportsLine expert Josh Nagel is on a 13-3 run in picks involving Purdue or Tennessee the past two seasons, so before you lock in your bet, you'll want to hear what he has to say. Head over to SportsLine to get his strong play on this matchup. Pretty simple here: these are the two best teams in Adjusted Defensive Efficiency over at KenPom, and they're the two best teams by a wide margin. 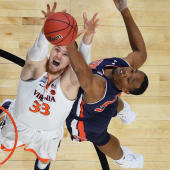 The difference between the third-best defensive team (Virginia!) and the second-best team (Michigan) is virtually the same as the difference between Virginia and the 10th team in the metric. The point being that the Red Raiders and Wolverines are both lock-down defensive teams. Both are pretty good offensive teams too. Texas Tech is 35th in offensive efficiency and Michigan is 19th. But neither is elite, and both are very methodical. Chris Beard's team ranks 232nd in adjusted tempo and John Beilein's crew is 316th. You saw against Florida how the Wolverines can just grind things to a halt, and we got a similar glimpse of it with Texas Tech against Buffalo. This is a grind session. Go low. What are the wiseguys betting on Thursday? Head over to SportsLine and find out what Vegas sources are saying about the action on today's Sweet 16 matchups before you place your bets. Now this is a tiny number. The biggest concern in it hitting wouldn't even be the Cavaliers' second-rated offense or Oregon's reborn offensive attack led by Payton Pritchard. It would be if this game gets out of hand a la the Ducks' last game against UC Irvine, which eventually ended up pushing 127. It never should have been close: that game should have ended up way under. And I think the Ducks and Cavs get in a bit of a slugfest here, again because of tempo. Oregon is 328th in adjusted pace, while Virginia is 353rd. These teams will be fresh with a week's rest, but there could be some nerves early for the Cavaliers, who have not been outstanding out of the gate in their last few games dating back to the ACC Tournament. Oregon has held its last three opponents to an average of 52 points per game. It's possible we get a mini-shootout here, but I'll trust the grinders to grind and hope we don't have shenanigans late that push it over the top. SportsLine expert Mike Tierney has been locked in when it comes to the Ducks, going 8-1 in his last nine picks involving the team, and he's locked in an ATS pick for this matchup. Go check out what he has to say over at SportsLine before you make your pick.